Michael is the Senior Partner of Box of Crayons. This is a company that helps organisations to do less Good Work and more Great Work. In this presentation at Google Michael talks about the concept of doing great work. He begins by explaining three kinds of work. Bad work is bureaucracy and can be mind-numbing. Good work is being efficient and fulfilling your job description. It is important to do, but it can be a bit of a trap. Great work is work that matters to you. It has meaning and makes a positive impact. People and organisations must do good work. This is vital to keep the engine running. But such work is easily replicable. The key is to do great work that enables the organisation to stand out. 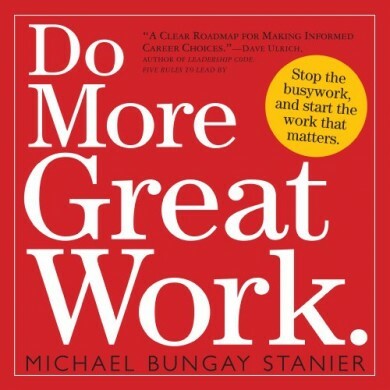 Michael also outlines three ways that people often find and do great work. These are Disaster, Delegation and Discovery. You can find great work when dealing with a disaster. People often rise to the occasion during a crisis. But the problem is that people sometimes wait until this happens before doing such work. You can find great work through it being delegated to you. A boss may ask you to tackle a piece of work that you find stimulating. This if fine, but again it is out of your gift. You can find great work through discovery. You can be proactive and, for example, focus on a specific project. You can find the seeds of future great work in your past projects. You can focus on your present good work. You can learn more about Michael and his work at the Box of Crayons site. Here is a video on the theme of doing great work.